The book was released by author Prof. Sundaram Janakiramanan, followed by the workshop on “Derivatives and Risk management” in Vellamal Engineering college, Chennai on Feb 9. It started with the inaugural speech by MVL Velmurugan, CEO, Vellamal Educational Trust followed by Mr. N Ram’s speech, Chief Editor, The Hindu. 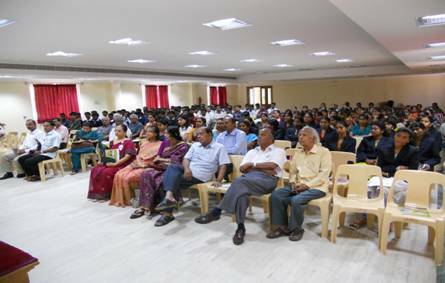 The workshop was attended by more than 40 faculty members from various colleges across the city and the students of Vellamal Engineering College. Prof. Janakiramanan spoke on general finance as an important topic and educated everyone about the Derivatives as a vital financial instrument. He imparted knowledge about the function of derivatives and many risks associated with their use. He explained briefly about four types of derivatives—forward contracts, futures contracts, swap contracts and options contracts and relevance of the book for postgraduate students of commerce, finance and management, because of the cases, theory and problems included in it that explains the concepts in a lucid and easy manner. He then addressed the queries of the participants and differentiated between the stocks and the derivatives as the names are commonly misperceived together. He explained how the book would be of use to fund managers, risk-management specialists, students taking the CFA examinations and anyone who wants to understand the derivatives market in India. The knowledge enriching workshop ended with a lot of appraise from the faculties and the participants, as well as compliments for launching a vital book for the post graduate management students.